This splendid series of slim biographies nears completion with a satisfying life of our ninth and least important president. New York Times columnist Collins (When Everything Changed: The Amazing Journey of American Women from 1960 to the Present, 2009) admits that Harrison (1773–1841) accomplished little before dying a month after inauguration. His career peaked nearly 30 years earlier, but he was not the first politician to milk earlier triumphs. The son of a prosperous Virginia planter, he served several years in the Army before using family influence to win appointment as Indiana Territory governor in 1800, where his job was to encourage white settlement and remove Indians. He won a national reputation after the 1811 Battle of Tippecanoe, a bloody skirmish in which far more whites than Indians died. As a general in the War of 1812, he won the Battle of the Thames in Canada, another glorified skirmish that was acclaimed because the widely feared Indian leader, Tecumseh, was killed. 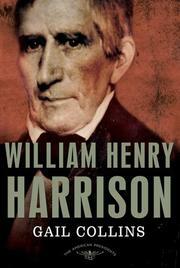 Resigning in 1814, Harrison retired to his Ohio estate and a mediocre political career, winning some offices, losing others. He was the first Whig candidate for president in 1836 and lost, but won in the famously lowbrow “Tippecanoe and Tyler, too” 1840 campaign, which began the American tradition (unique among democracies) of candidates boasting that they are no smarter than the electorate and that this ordinariness makes them fit to lead the nation. Although more a journalist than a historian, Collins has done her homework and written a lively, opinionated portrait of early-19th-century America and the modestly talented general who briefly became president.